Yuyanapaq was a transmedia photography project commissioned by Peru’s Truth and Reconciliation Commission that aimed to build collective memory in the aftermath of Peru’s internal conflict through an online photographic archive, a photography book, a large permanent photo exhibition and multiple travelling exhibitions. 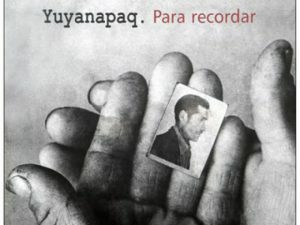 In Quechua (Peru’s predominant indigenous language), Yuyanapaq, means ‘to remember’. Yuyanapaq was led by the photographers, Mayu Mohanna and Nancy Chappell, who curated a selection of images from more than 90 archives covering the armed conflict from 1980-2000, among them those of private collections, the press, news agencies, the Armed Forces and Police, human rights institutions, community photography projects, the Church and family photo albums. The Yuyanapaq images were intended to intervene in and build a visual narrative, national consciousness and shared memory. The organisers sought to use images to evoke the kind of emotional response that the Commission’s written report could not do one its own, especially for those Peruvian audiences unaffected directly by the suffering and pain generated by the conflict and unlikely to read the 5000 page report. Salomón Lerner Febres, the philosophy professor who was President of Peru’s Truth and Reconciliation Commission described the images as giving ‘us an urgent mandate: to ensure that the past is never forgotten, either on purpose or through indifference’. The Lima exhibition was popular and critically acclaimed, responses were overwhelming positive (Saona 2009). It attracted high visitor numbers and considerable media coverage. It was credited with transforming critical and negative media coverage of the Truth and Reconciliation Commission and paving the way for the positive reception of the Commission’s final report and its message (Hoecker 2007). However some indigenous communities affected by the conflict were less enthusiastic and some did not want to the photographs displayed in their communities. In Ayachucho, one of the regions most affected by the conflict, the exhibition was poorly attended and some visitors to the Lima exhibition questioned the apparent ‘truths’ offered in the photographs (Poole and Perez 2010). The Yuyanapaq exhibition is on permanent show in Lima’s Museo de la Nacion until 2026. The online archive brought together over 1700 images that are available to search through the Truth and Reconciliation website here: http://www2.memoriaparalosderechoshumanos.pe/apublicas/galeria/list_categorias.php . The main Yuyanapaq exhibition was in Lima in 2003 and featured over 200 images. Smaller exhibitions were shown in provincial towns throughout Peru and travelled overseas. The Yuyanapaq book included 80 images from the exhibition. Lerner Febres, S., 2003. Inauguracion de la Exposion Fotografica Yuyanapaq. Palabras del Presidente de la CVR [WWW Document]. Comision de la Verdad y Reconciliacion. URL http://www.cverdad.org.pe/ingles/apublicas/p-fotografico/index.php (accessed 5.7.13). See the New York Times press article, June 27th, 2004 : http://www.nytimes.com/2004/06/27/world/peru-photo-exhibit-captures-pathos-of-20-years-of-war.html?_r=0. Saona, M., 2009. The Knowledge that Comes from Seeing: Yuyanapaq and the Peruvian Truth and Reconcilation Commission. Hispanic Issues 4, 210–233. Hoecker, R., 2007. The role of photography in Peru’s truth and reconciliation process (Master thesis). University of Missouri-Colombia, USA. Poole, D., Perez, I.R., 2010. 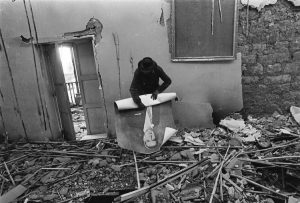 Memories of Reconciliation: Photography and Memory in Postwar Peru. Hemispheric Institute E-Misferica 7.2. Avaliable at: http://hemisphericinstitute.org/hemi/en/e-misferica-72/poolerojas. Full speech can be found here: Lerner Febres, S., 2003. Inauguracion de la Exposion Fotografica Yuyanapaq. Palabras del Presidente de la CVR [WWW Document]. Comision de la Verdad y Reconciliacion. URL http://www.cverdad.org.pe/ingles/apublicas/p-fotografico/index.php (accessed 5.7.13).